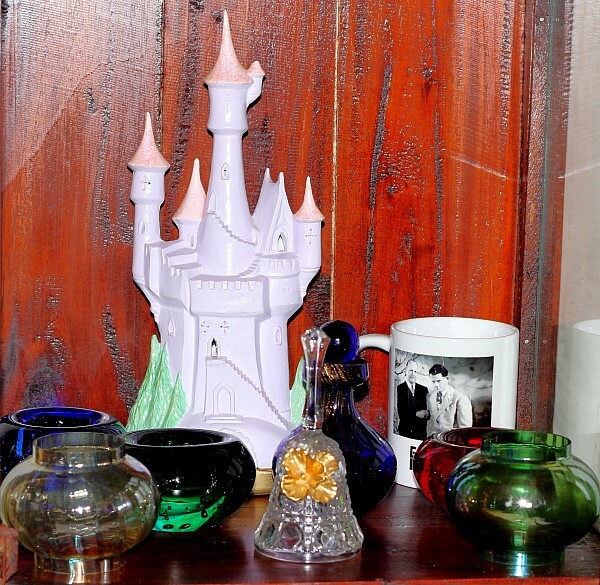 As requested by Fish Of Gold on the Long Weekending post, here are some closer shots of my collectible cabinet. First I should mention that the cabinet itself was purchased several years ago at an imported furniture sale. 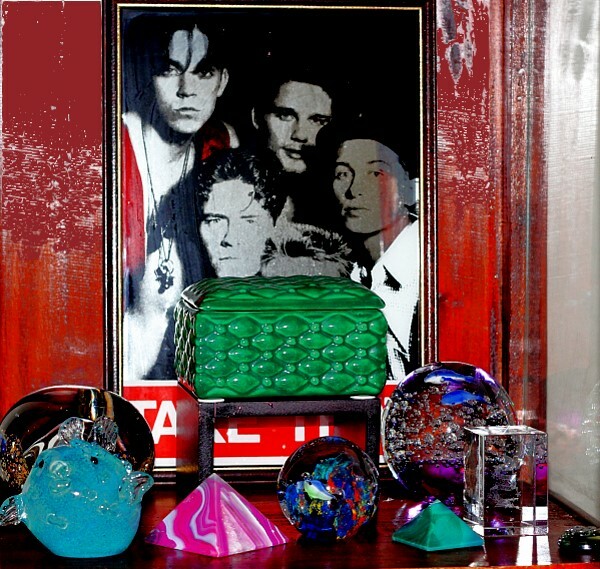 It is similar in style to my other glass cabinet which we had purchased in Adelaide..
At the back is my Take That Mirror – I had all kinds of Take That merchandise – In front on the stand is a ceramic jewellery box which I painted myself. The large blue puffer fish sits in front of my paperweight. There is a pink crystal triangle, another paperweight with fish and coral, a green crystal triangle, a block of glass with a dragon etched inside it which is designed to stand on an LED light stand, and though you can’t see it very well, a metal snake attached to a green crystal. This is my China themed shelf. 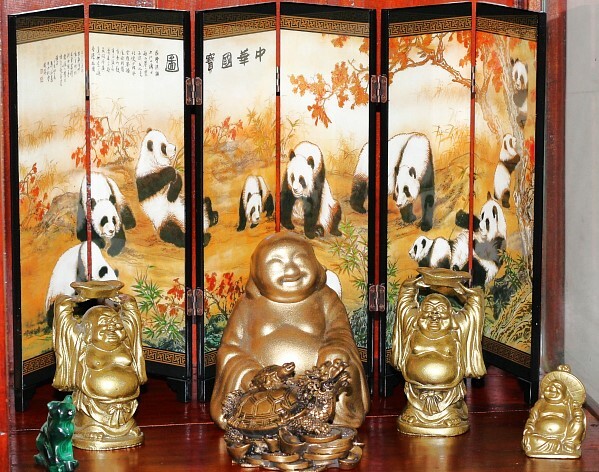 It has a special folding Panda screen given to us by my Chinese cousin. In front is a ceramic Buddha that The Other Half made at ceramics, and then some other Buddhas I have collected over the years many of which sat on my work desk in various call centres. They have Feng Shui uses. Also there is a Green Malachite cat which was brought back for me from Africa by my Dad. 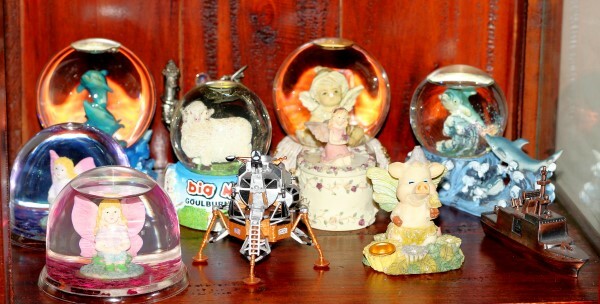 On this shelf – Many of my glass snow globes. I don’t know why but the water inside seems to be receeding – they all were completely full when I got them and I can’t find any leaks.. There is also a moon lander bought from Aldi, a ceramic keepsake holder, a ceramic pig figure, and a copper pencil sharpener boat. You have many treasures and an excellent eye. I especially love the Chinese shelf. Pandas!! Thanks Margaret! :) I love the panda folding screen. I rather liked Take That, especially in their early and fresh days. I like the paperweight shelf, not just for the photo. It’s very pretty and so clean! I like the moon lander a lot and those deeply coloured tea light holders. Those deeply coloured tea light holders were cheapies from Ikea. They have a huge range of awesome candle stuff. I love the moon lander – the cupboard tends to keep the dust out which is good because the moon lander is not easy to dust! :) A quick wipe down on the top of the wood is all it usually needs. :) Once every couple of years I will do the glass with windex and paper towel.